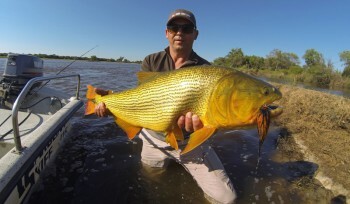 Argentina Golden Dorado fishing is a must for any angler and we encourage all our hunters to try their hand at Golden Dorado fishing for at least one day. At the town of Esquina, the convergence of the mighty Paraná River and the smaller Corriente River creates an enormous wetland called the Paraná River Delta. Much of the waters we fish lie within a protected biological reserve, offering the most beautiful and productive Golden Dorado water in Argentina. Golden Dorado are Argentina’s most ferocious and top aquatic predator. They are extremely aggressive fighters and very acrobatic, making 6-7 jumps while hooked. With their tough attitude and radiant gold color, Argentina Golden Dorado are without a doubt one of the most exciting freshwater game species in the world. Anglers can expect to hook several fish from 5-8 lb, some in the 10-12 lb range and even fish over 15 lbs. Other exciting game fish include, Palometa, Pirana, two kinds of Surubi Catfish, Chafalotes, River Salmon, Dogfish, Boga and Tararias. Two anglers will cast simultaneously from comfortable 17 ft motorized skiffs. Throughout the day, we’ll be changing our spots constantly looking for fresh and large fish at the mouths of channels and drop offs and around shore structure. Golden Dorado fly fishing requires an 8 wt. fly rod, 30lb wire leaders and 5 inch flies tied on 3/0 saltwater hooks. Dorado flies can be purchased at our lodge. Bait casting rods are also an extremely effective method for Golden Dorado fishing and we encourage any angler to bring casting rods or try one of ours. The lures we use are 3-5 inch hard plastic crank-baits for both top-water and subsurface. In the Esquina area, the fishing season runs year round for Golden Dorado. Fishing is generally best during the hot months of Nov-April and slower during the cooler months of June-August. However, Dorado fishing can be very good during these winter months as well. A few consecutive warm days during the winter usually brings explosive fishing. Argentina Golden Dorado fishing depends more on the conditions of rivers and weather, and less upon the particular time of year. Fishing the Corriente and Paraná Rivers and the delta offers a variety of fishing scenarios and beautiful scenery. These three different bodies of water are somewhat independent of each other and we’ll be concentrating on the areas that are fishing the best.